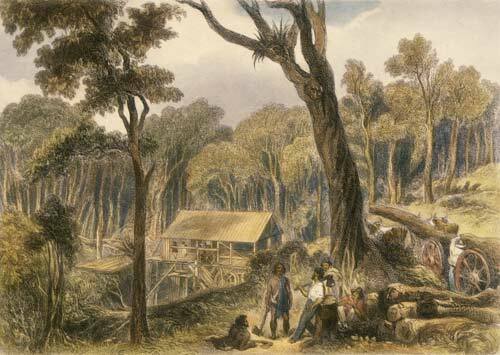 Māori timber workers stand with Europeans outside an early water-powered sawmill in this 1840s engraving of a drawing by Samuel Charles Brees. Māori were involved in the timber industry from its earliest days, first hauling logs and loading them onto ships, later felling and milling trees. In the first half of the 19th century they often controlled the timber trade in their tribal areas, bargaining with Europeans over cutting rights, port fees and labour.